All data, photographs and documents on this page are presented with the express permission of e-EyE. Photographs are the property of e-EyE and must not be reproduced elsewhere without prior consent from e-EyE. Remote hosting of one's equipment is a big step up from setting up just outside your house or around your local area, particularly if you do not have a permanent setup as it stands. It means leaving your equipment at a remote location, sometimes hundreds or thousands of kilometres away, not immediately accessible, and only controlling it remotely through the Internet. Unnerving as it may seem at first, it is also an amazing way of delving deep into astrophotography - it potentially provides better imaging conditions (SQM, seeing, etc), more nights per year that you can image, imaging on work nights, imaging mostly if not completely automated and also without having to ever set up and dismantle your equipment again. ​A robotic telescope is essentially a complete astrophotography setup that has been set up in such a way that absolutely everything about it can be controlled remotely without direct physical intervention. ​Entre Encinas y Estrellas (e-EyE) is one of numerous remote hosting facilities dotted around the world. In particular, e-EyE is located in the heart of Extremadura in Spain, as shown on the map and below. ​e-EyE's remote hosting facilities are bar-none some of the very best in the world and without a doubt, the best in Europe. The observatories house six to eight modules and are built slightly elevated above a massive concrete slab put into the ground. Part of this massive reinforced concrete slab are the piers that stick out and into the observatory through the flooring. This is where customers place their mounts, usually with some extension to height. Around the piers is removable flooring that gives access to one's own wiring (mains electricity and network). ​Each module is completely isolated from the modules next to it. The retractable roof is controlled by the customer alone - there are no communal roofs. This means that renting a module to remotely host your equipment gives you your own observatory for all intents and purposes. The module consists of a 3.5 x 3.2 metre floor space with your own retractable roof, allowing you to place whatever equipment you want as long as it fits inside the module. ​Any trigger to closing the roof also parks your mount through an ASCOM Park command. The ASCOM program can wait a specific amount of time for the mount to park, or wait for magnetic sensors on your mount (provided by e-EyE, which can be stuck to your mount) to report that the mount has finally parked. All this ensures your equipment is fully protected at all times, even if you are not personally monitoring it. For added peace of mind, customers tend to bring a webcam that is placed on the wall directly facing the equipment, and connect it either directly to their computer via USB (with an extension) or to the network (if it is an IP Camera). This allows the customer to monitor his/her equipment directly. 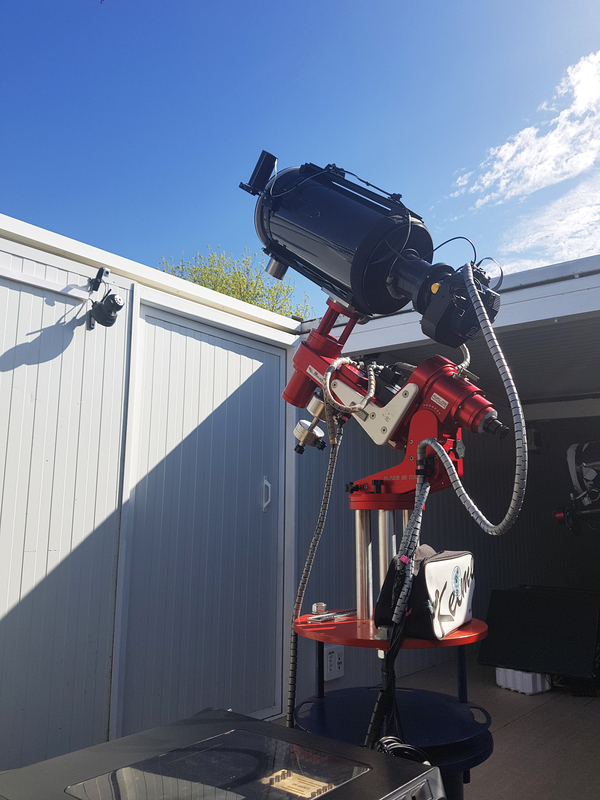 In addition to the observatory module rented, customers get access to e-EyE's own AAG CloudWatcher, which provides live data on cloud cover, wind, temperature, rain and sky brightness (updated in minute intervals or on user request). Customers also get access to live SQM data and seeing data captured by on-site cameras and to an All-Sky camera (to monitor the night sky in real-time). The live feeds from all these cameras are accessible via the e-EyE website, allowing all devices to access them. The Internet connection at e-EyE is a fibre optic connection providing symmetric 100 Mbps​ download and upload with plenty of room to expand to further bandwidth if required in the future. The experience of remote control is beautifully smooth and responsive at all times of the day, from anywhere in the world. Lastly, e-EyE offers different levels of support to customers. Major works on customer equipment can be carried out by e-EyE staff at some minor extra cost, but small and common works are carried out by e-EyE staff free of charge. The staff are always extremely friendly and supportive and share the same passion for astrophotography. 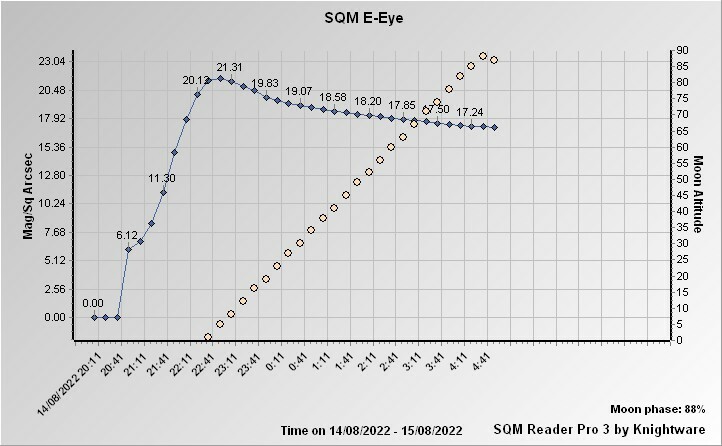 In fact, the average SQM reading at e-EyE is 21.5, with readings as high as 22.7​ in some instances. Indeed given e-EyE's location in Spain, it is an extremely dark night sky site and therefore makes it an ideal location for astrophotography. 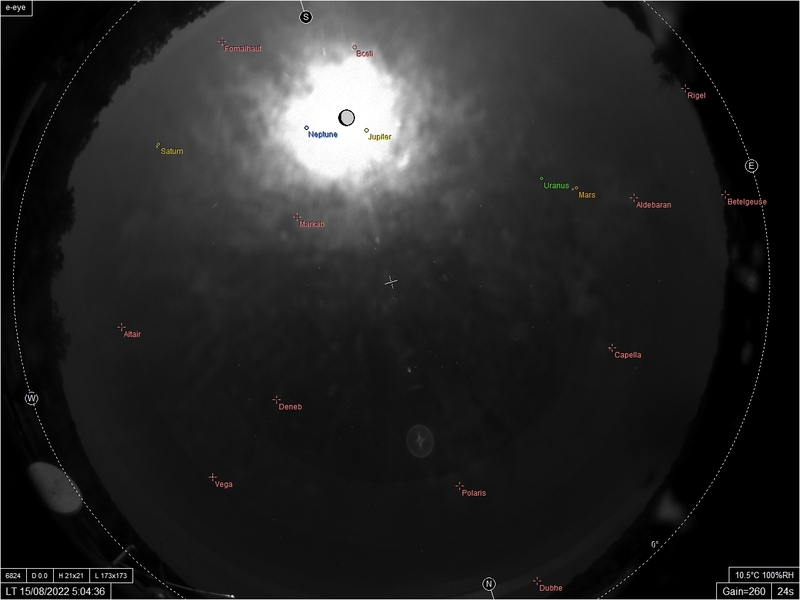 Moreover, given the latitude at e-EyE, it gets a clear view of the Milky Way core to the South - an area that cannot be imaged by astrophotographers living significantly North of Spain. The following are some wide-angle night sky photographs captured on a DSLR, to demonstrate the impressive quality of the night sky at e-EyE's location. ​​Last but not least, the weather at e-EyE's location. Spain is generally known for its good climate throughout the year, and e-EyE is no exception. In fact, given e-EyE's distance from the sea, high altitude above sea level and location within Spain, it is subject to extremely dry climate during most of the year. Humidity levels fall below the 30% mark during the driest months of the year. Dew heaters are generally only needed for two months in the year. On average, e-EyE has been recorded to see 200 clear nights a year, available for astrophotography. The minimum that has been recorded the last few years has been 132 clear nights and the maximum has been 236 clear nights. At night, local temperatures fall to around 0°C during winter months and 15°C during summer months, allowing very effective and consistent use of cooling on imaging CCD cameras all year round. The basis behind e-EyE is to be an astronomical complex. As such, it offers many things beyond simply hosting your equipment in an observatory module. On-site in its secure facility are a number of modern houses for customers to stay in overnight. These houses and the surrounding grounds are stunningly beautiful and perfectly blend together the rural location with modern architecture. As you walk up the footpaths on the grounds, dim red lighting illuminates your path. Each house is of a different size, accommodating different number of guests, although they all offer a porch, a kitchen, a sitting room with TV, one or two bathrooms and one or two bedrooms. The houses are situated a few minutes walking down the footpaths, on the opposite side of the grounds to the observatories. Just outside the houses is a swimming pool that can be used freely by guests. The houses and every single corner of the e-EyE site itself is fully covered by Wi-Fi Internet access, provided for all guests to use freely. The e-EyE grounds themselves are extensive and have two large areas where cars and even motorhomes can be parked (one area near the observatories and another area near the houses). Adjacent to the e-EyE grounds themselves, about 9 kilometres down the road, is Fregenal de la Sierra - a small town with fantastic local food of Extremadura and all necessary amenities. The surrounding area of Extremadura is also rich in history, culture and sites to visit for anyone wanting to do more than just astronomy. Near the observatories on the grounds themselves is a large circular platform with a couple of benches. This is wired up to mains electricity via a few points and has Wi-Fi coverage for Internet access. This platform is normally used for star parties, but can also be used by house guests to put up their equipment and connect to it via Wi-Fi from another computer in their rented house. This means that customers renting a house can also take advantage of e-EyE's amazing night sky to practice some astrophotography during their stay, taking advantage of remote control locally within the grounds themselves. Surrounding the large circular platform near the observatories is an area for BBQs, which are sometimes hosted during star parties and other events. Also nearby is a conference room with bathrooms just outside, a large table, a kitchenette, a projector and a screen. This is used to host courses on numerous areas of astronomy, taught at e-EyE. 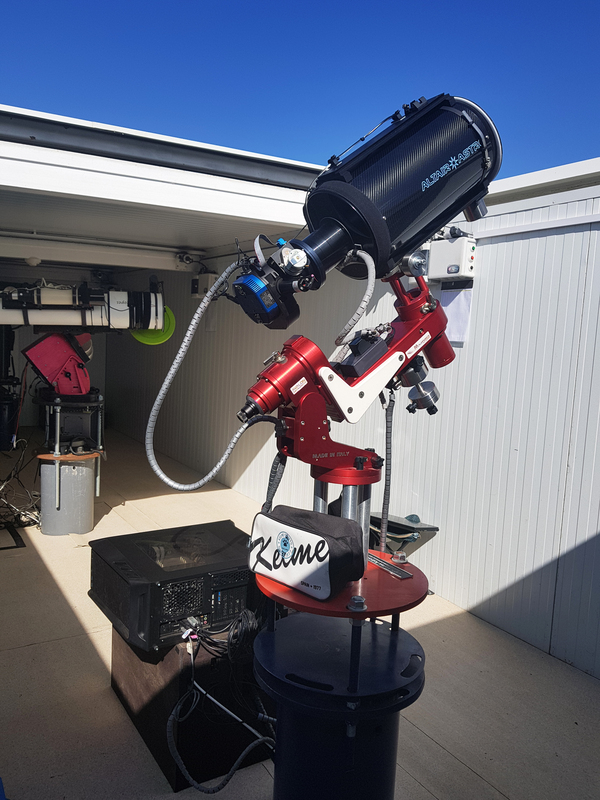 Customers who are renting an observatory module for their equipment enjoy a 15% discount on all house rental prices listed above. The following are some photographs of my setup at e-EyE, based in their first observatory module named Apollo I. My observatory itself is of course named after this website - Light Vortex Astronomy​. ​The pier adapter provides a very stable platform via 25 cm long bars that screw on to the Avalon M-Uno pier adapter. A small toiletries case contains the autofocuser controller and the dew heater controller, protected from any humidity and relatively close to my telescope. The computer that controls all the equipment is a custom build consisting of an Asus Maximus IX Hero motherboard, Intel Core i5-7600K CPU, Corsair Vengeance LPX 16GB DDR4-3200MHz RAM and Samsung 840 500GB SATA SSD, powered by an EVGA Supernova 550W modular power supply. As a PC gamer, this is a basic build for me because the CPU is not a Core i7 or newer Core i9, makes use of integrated graphics and sound and the SSD is not as performant as M.2 SSDs available today, which the motherboard does support. The important thing is that the computer provides an overkill of performance for the tasks it needs to complete, and quite importantly, provides a total of 13 USB ports wired directly to the motherboard! This was one of the main reasons for choosing such a high-end motherboard for this custom build. 6 of the USB ports are 2.0, another 6 are 3.0 and there is a single 3.1 port available in addition to these. So many USB ports means I never have to worry about using USB hubs and everything is directly wired into the motherboard for ultimate reliability. The computer sits on its side on top of the electrics cupboard. Perhaps a first for me - I had to ensure none of the integrated LEDs remain on and that all the fans I install do not have LEDs on them. For this, I chose 7 BitFenix Spectre Pro 120mm black fans. The computer is as loud as a tornado, but it certainly remains well cooled! To the side of the pier, inside a cupboard, are all the electrics. This includes two UPS units, two surge protector extensions (one British, one European), the Dragonfly remote power relay, the AAG CloudWatcher Solo​, an 8-port Ethernet network switch and all the individual equipment 12 V transformers. The Dragonfly is controlled via software installed on the computer, which finds it through the local network (the Dragonfly only takes an Ethernet connection). This controls power to my mount, CCD camera, autofocuser, dew heater, IP camera, motorised telescope cover and my computer. I am able to log on to my Dragonfly from my home computer or Android mobile devices and switch power on to my computer. The computer then automatically switches on and logs on to TeamViewer​, affording me remote access. In addition to all this, my IP Camera is mounted on the wall overlooking my entire setup for visual inspection. So far, the experience of having my equipment hosted remotely at e-EyE has been extremely rewarding. I have been able to really step-up my game when it comes to high-quality astrophotography and over a great number of hours exposing targets. I have been able to enjoy runs of amazing weather such as 30 nights of continuously excellent night skies with zero cloud cover or rain and SQM values consistently above 21.5 (except when the Moon is up, of course). One of the obvious advantages is the fact that I can set up my imaging runs on Sequence Generator Pro and go to bed. Automatically, everything I want is captured until a certain end time I set, which is when my mount is parked and the roof is closed. All the while I receive status update e-mails that I can pick up on my phone. In the morning when I get up for work, I simply log on via TeamViewer for 5 minutes, close programs and switch the power off and later in the day, I log back in and download my night's exposures to my home computer. Together with the fact that the equipment is set up on an extremely solid pier and without having to do anything except switch on and image, I would not be able to go back to a non-robotic setup. e-EyE is bar none the place you want for remote hosting. If you would like more information regarding remote hosting at e-EyE or would like to enquire about pier availability, you may e-mail kayron@e-eye.es, which is my official e-EyE e-mail address. I work with e-EyE as a partner, handling assignment of customers to observatory modules, preparing their piers, helping them with the required equipment for remote hosting and also providing technical support where necessary. Since I am physically based in Gibraltar and not e-EyE, some things customers need are referred directly to e-EyE.